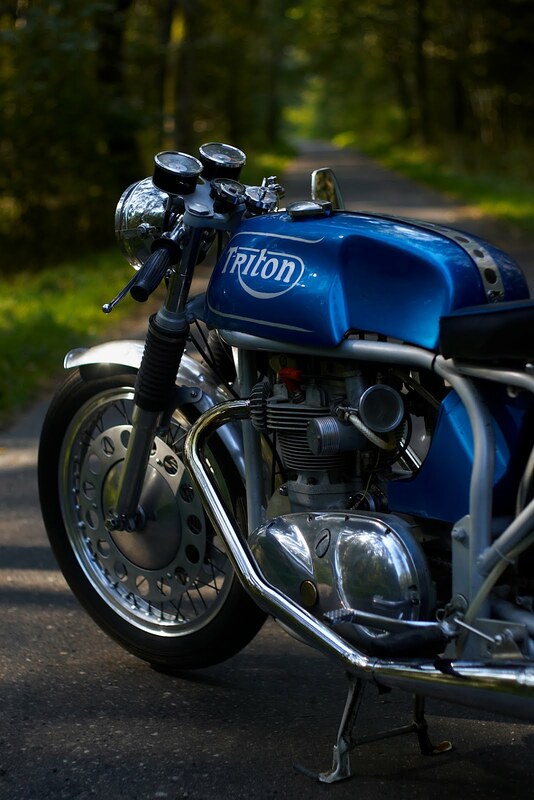 In our opinion, owning a classic British bike is not just a means of transportation, it’s a way of life. When these beautiful machines from the likes of Norton, BSA, Triumph, AJS, Velocette, Matchless and Royal Enfield they fast became impassioned for their precision engineering, style and performance. Here at BritBikes we understand the passion and dedication when it comes to classic motorcycles, which is exactly why we formed britbikes.co.uk to help keep these glorious machines not only on the roads but in the homes of those who adore them. Our blog is a support engine for you all to read about not just us, but for you all to share your restoration stories, history, tips and enthusiasm with the world of British bikers. So somewhere along the winding road we totally lost touch with the blog! It popped into my head tonight as I was sat checking our stock (yes its Sunday night at 11pm and I have my head in the stock sheets making sure you have everything possible available) and I casually scrolled past the link to our blog and thought, for probably the 100th or so time...I must write to you all, its been a while. Well here we are, although it seems it has been a few years not the 6 months or so my memory was nagging me for to get back on here...massive apologies all around. So lets do this, back to it as they say! Feel free to hit us up with any topic suggestions you would like us to chat about and fingers crossed I don't bore you stupid with my ramblings! I find the history of companies fascinating, especially those linked to the history of motorbikes and the evolution of Lucas is certainly a good read...we can thank them for keeping many classics going today and playing a big part in what we do too! Lucas was established in 1872, the same year that the petrol engine was first patented. The first Mercedes 'horseless carriage' was still 14 years away and the Ford Model T wouldn't appear for a further 27 years. The business that Joseph Lucas founded in Birmingham, still the global HQ of Lucas today, represents the consistency and durability of Lucas products and has made Lucas one of the most successful automotive brands in history. Joseph Lucas was born in Birmingham in 1834 and, following a natural business acumen, began in the early 1860s as a dealer in paraffin oil for domestic lamps and other products. In 1875, a small workshop was opened in Little King Street with 5 employees. The early product range included ship's lamps (Tom Bowling) with the first "King of the Road" cycle lamp, for use on the Penny Farthing, produced in 1878. An official patent was obtained in 1880 for the "King of the Road" bicycle lamp. In 1882, Joseph formed a private partnership with his son, Harry, trading under the title of Joseph Lucas & Son. The "King of the Road" Lion became a trademark in 1884 and remained a major feature of Lucas advertising for the next 80 years. Business expanded dramatically in the bicycle boom of the time. A new factory was built which later developed into the iconic Great King Street premises for the major and successful Lucas Electrical business in Birmingham. By 1897 a public company, Joseph Lucas Ltd, was formed with Joseph as Chairman. The company had now achieved a leading position in its market and was perfectly positioned to move into the infant automotive parts and accessories market. Joseph Lucas died in 1902 to be succeeded by his son, Harry, as Chairman. Lucas was perfectly positioned to take advantage of the expanding motor vehicle market which was stimulated by a Parliamentary Act in 1903, which raised the speed limit above walking pace, making the use of cars more attractive. The range extended to include cycle, motorcycle and car accessories including oil, acetylene, and electric lamps. Great King Street was expanded to meet increased demand. Range extensions continued and the acquisition of Thomson-Bennett Ltd provided magneto capability to add to the growing Electrical portfolio. This included starters and dynamos (first produced in 1912). This period saw further rapid expansion as Lucas grew alongside motor car production. Several acquisitions were made but by far the most significant was in 1926 when the companies of C.A. Vandervell & Co. Ltd. and Rotax (Motor Accessories) Ltd. were brought into the organisation. Lucas became the largest supplier of electrical equipment to the vast majority of British vehicles and the largest manufacturer of accessories. Following acquisition, the CAV factory in Acton was reorganised to concentrate on all types of commercial and heavy-duty electrical vehicle equipment. Work also began on fuel injection pumps for diesel engines through a partnership formed with Bosch, whose shares were bought back in 1937. Rotax focused on developing the aviation business and was the foundation of the future development of Lucas Aerospace. Lucas purchased the British Bendix company from Bendix US as the first step into the braking business. In 1943, the Girling brake business was acquired from the New Hudson company, adding hydraulic braking to the company's product portfolio. In 1951 the title of the company changed to Joseph Lucas (Industries) Limited which became a holding company and distributive subsidiary companies were set up due to the ever increasing range of products. There were 8 manufacturing groups in the UK and more than 12 distribution companies operating overseas. Product milestones included the first disc brake fitted to a production car and the introduction of the DPA rotary fuel injection pump. By 1960 there were 57,000 employees and expansion across Europe was gaining momentum. This included brake manufacturing in France and Germany, diesel partnerships in France and Spain plus a significant development of the aftermarket network. Lucas Service was by now a global enterprise. Lucas exported to over 130 markets with around 4,000 authorised outlets. Lucas began the 1970s as the 54th largest company in the UK. The group was renamed as Lucas Industries in 1974 and a new Lucas corporate identity, including the Lucas diagonal, was introduced in order to meet changed national and international trading conditions. This resulted in the loss of the individual brands of Lucas (lion), Girling and CAV which had gained world-wide recognition. A period of restructuring and refocusing into overseas markets followed the decline of the UK car manufacturing base. By the end of the decade the focus of Lucas Automotive (created in 1988) had moved into the production of high-technology engine management and braking systems for automotive customers around the world. Brand transition to the single Lucas green image was completed in 1994 with consistent application across signage, publications, product packaging and advertising on a worldwide basis. Trends within the motor industry towards globalised production and demand for high technology products continued during the 1990s. The noughties was an eventful decade for Lucas. In 2003 the decision was made by TRW to license the Lucas brand to specialist licensees who could continue the development and investment of the Lucas programs. At this time Lucas has been trading continuously for over 125 years and is world famous as a supplier of premium quality, technically excellent automotive and motorcycle products for both vehicle manufacturers and the aftermarket. Today Lucas continues to grow in these channels while dynamically expanding into new markets with new products. Lucas is a thriving global brand with a strategic network of Lucas businesses, head licensees and distributors together contributing to worldwide sales of over $100 million. I am sure that most of us will remember the saga of their first motorbike. Inevitably for some it will have involved the modern form of restrictive practise known as CBT (Compulsory Bike Training I think its called?). For others of a certain age it will be the super mopeds of the mid 70’s when manufacturers found ways to make a moped (with two pedals so ostensibly it could be ridden like a bicycle! ), into a pseudo sports machine of 50cc that was restricted to 30mph. However, for those of us of advancing years, we fondly remember the halcyon days before all that, when at the tender age of 16 and armed with your provisional license, for which nothing else was required other than the ability to fill in a form, you were able to ride any motorcycle up to 250cc (with L plates of course). Now strictly speaking, my first bike was not a road going bike at all but in fact something called ‘The Trog’. I really can’t recall why it was so named but ‘The Trog’ it was always known as by me and my group of friends. We were around 14/15yrs old and one of my mates who had some basic engineering talent along with help from a big brother, managed to perform (what seemed amazing at the time), the feat of putting (I think) a lawnmower engine into the frame of a smallish bicycle. The only way to start it was to run alongside and hold one hand over the carb intake to act like a choke and somehow hold the other on the throttle whilst at the same time pushing it (or getting someone else to push). If you were lucky it would fire up, if you weren’t so lucky it backfired out of the carb singing your hand. Once running and you managed to jump onto it, off you went, thrilled by the feeling of the immense power it seemed to have(!). It probably went no more than 25mph but at the time that seemed fast! Now for my first go, I made the basic error of not knowing which way the throttle turned to make it go faster. This was not helped by the fact that the twist grip was loose on the handle bars and there seemed to be no spring in the carb to give some feel to it. Anyway, not having yet mastered the intricacies of getting it started and riding it, for some reason I volunteered to look after ‘The Trog’ for a couple of weeks. My parents had gone away on holiday and one of my jobs whilst they were away was to keep the lawn cut. After having given it its first cut, I decided that riding The Trog around the back garden would enable me to get some practise on starting and riding the infernal beast and so I could hold my head up high with the gang. The back garden was not huge but by going down the side of the house as well, I made a little circuit. Not realising at the time that my continual circuits were starting to create a significant ‘track’ in my father’s well-tended and manicured lawn, I thought it was great fun and saw myself as the next Jeff Smith appearing on the (sadly missed) TV scrambles of the 60’s. However, towards the end of the second week, and after several friends had also lapped the same track many times, it dawned on me that I had rather messed up the green baze. At that stage there was little I could do. Should I just ignore it and pretend it was nothing to do with me. Unfortunately I really had no choice and when my parents woke up in the morning after arriving back late at night from their holiday, I knew by the look on my old man’s face as he surveyed what had become of his treasured lawn, that I was in trouble. The end result was that I was told that when I became 16, I could forget any ideas of getting one of those ‘evil’ motorbikes. I am not sure what became of ‘The Trog’ but it lives on in my memory as my first motorbike. By the age of 16 I was itching to get on the road and get some freedom. I was still at school at this time. A couple of friends had already bought scooters or mopeds (proper ones! ), which they proudly arrived on in the mornings, parking in the teachers car park. I guess time heals as they say, so not long after my birthday I persuaded my father to take me to a motorcycle dealer to have a look at what I might be able to get with the £65 I’d saved from paper rounds, washing cars, birthdays etc. I was lucky enough to be 16 just before they tightened up the regulations on what you could ride as a learner at that age. I ended up buying a 1961 BSA Bantam D7 175cc. So, like many of us from that time of the 60’s and 70’s I started my motorcycling days on a BSA Bantam. I thought it was the bees knees. I felt great. I had a ‘proper’ motorbike, not a Vespa or a Mobylette but a big red machine that had the immortal letters BSA on the side of the tank. It would get me to just over 60mph with a following wind. At the time it seemed so fast….I remember sitting in the classroom doodling ‘BSA 175’ on my exercise books and looking forward to the end of school bell. I could turn left up to the school car park while most of my year were making their way out of the gate to walk or catch the bus. I would start up the Bantam and take the road that went past the bus stop just to make sure I was seen by my mates. However, this did backfire once when just around the corner from the bus stop, the little red devil broke down and had to watch as those envious faces at the bus stop had turned to laughs and various gestures out of the bus window as the bus went sailing past me. Of course the little Bantam was not without its faults (even then it must have been about 10 years old) but when it was running ok you forgave it and just enjoyed being on two wheels. But breaking down and having to push it once to often, started to make me think of getting something just a little larger and hopefully more reliable. So the next step on the journey of my British Bikes lead to another BSA, this time a BSA Starfire 250cc. It was only about 4/5 years old and was the earlier version which had been called the Barracuda for a short while before BSA changed the name. It was a good looking bike for a 250 I thought. The blue and white fibreglass tank enhanced by matching blue side panels and chrome mudguards. Most important of all though, it actually sounded like a big motorbike with its throaty four stroke sound. It went thump ‘thump thump’ rather than the ‘ ring de ding ding ding’ of the two stroke Bantam. Life is full of learning opportunities and the Starfire I bought was one of these. Unfortunately I made the classic mistake of viewing the bike on a dark evening under the light of a very weak street lamp. I also elected to look at it on my own and at that stage had little knowledge of what to look for in a four stroke engine. I was seduced by the sound it made and the feeling of a bigger bike than the little Bantam. Money changed hands (I think around £110) and I was the proud owner of another BSA. I sold the Bantam for about £45 and all seemed good. However, the Starfire very quickly started making very strange noises and it became apparent that a full engine strip and rebuild was required. The problem with the Starfire models was the way young lads like myself tended to thrash the engines and the previous owner had been no exception. The basic single cylinder engine was a good design in the larger 441cc and later 500cc versions, with beefier bearings and less highly stressed. However the 250cc model was always prone to bearing failures. Equipped with a new big end and cylinder rebore/new piston, my Starfire was carefully run in and I started to think about taking my motorcycle driving test so that I could eventually save towards a bigger capacity bike. Passing the motorcycle driving test would allow you to ride any size bike (correct me if I’m wrong here but I seem to remember that you needed to be 17 to actually ride a bike bigger than 250cc, even if you passed your test ). You would think that even in those far off days the test would involve some pretty serious examination of your abilities, so that you weren’t let loose on the general population of this country riding a massive fire breathing monster without showing how competent you were?…er..no, actually it was a very basic test. I remember arriving at the test station and after showing my prov. License, the examiner asked me to go outside and start my machine. He waited for me to get ready and then told me to go up the high street and do three right turns, around the block, to come back to him at the side of the kerb. This was pretty straightforward. I arrived back and he then said to do the same but in the opposite direction. He also mentioned that he would at some point step out from the kerb where I wouldn’t expect him and put up his hand at which point I should execute an emergency stop. It occurred to me that for 90% of the time, he wasn’t able to see what I was doing as I was riding round the block. Any way when I came round the second corner, he had obviously walked through a short cut and I could see he was standing there….so I was expecting him to put up his hand. I guess I was doing about 15mph when he actually did it, so not too difficult to stop! He then directed me to go back to the test centre where he asked a couple of questions from the highway code. After that he told me to go back inside and wait while he wrote up my pass certificate. All over very quickly…..I guess things have changed quite a bit from those days? More new genuine Lucas parts now in stock! As we are always aiming to please we have added the following new Lucas parts to our extensive range. OEM: 423871 Condenser BSA C11/12 Etc. 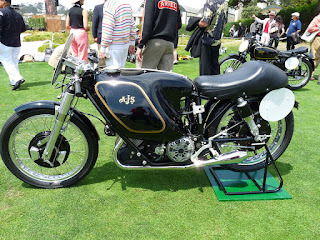 I saw in the news today that an 1954 AJS E95 Porcupine will be making a grand return to the classic TT in August, a massive 61 years after it last raced in the Isle of Man and is being celebrated by a riding a lap of honour at this year’s Jurby festival – certainly a sight I wish I was going to view! AJS were the only British manufacturer that built racers that were not retailed to the general public, producing four E90’s then moving on and making four E95’s. This precision made machine has to be one of the world’s rarest and most renowned motorbikes and is nothing short of stunning. Perceived during the Second World War and on a tight budget the E95 was originally designed to be a supercharged motorcycle, this was halted due to regulation and it needed to go back to the drawing board to make it perform without it. With changes made it went on to carry out its brief racing career, but to this day it remains the only twin-cylinder motorcycle to have ever won the 500cc World Championship. It’s amazing to me that after such a long time off the road and the fact that only four of these bikes were ever produced that we still have them surviving today. My hat comes off to Robert Ianucci for putting the money, time, effort and hard work into restoring such a massive part of motorbike history. After hearing that it took a lengthy 33 years to bring the E95 back to its full glory, needing extensive searching for data and parts that were not mass produced, plus even finding factory personnel involved in the production of the Porcupine I can say I am totally in awe of the efforts put in to what must have been the most ultimate restoration project I've have ever heard of – a true labour of love in my opinion. It is no mean feat as these machines share little with their manufactured counterparts. Finding one up for sale must be every classic motorcycle lover’s dream (I know it’s mine) and the last I heard of one selling, I believe at Bonham’s, it was anticipated to reach bids in excess of $750,000. This is no “barn find” or something a little bit rare you may stumble across on eBay once in a while, owning something like this is a once in a life time opportunity, something Robert Ianucci is a lucky man to be able to say he has had the pleasure of managing in his. With prices like that, my final thought would be that not only is this the epitome of classic motorcycle royalty, but most likely the worlds most expensive too. 50% off USA Delivery at BritBikes.co.uk! Yes we are offering half price shipping on our classic and vintage motorcycle parts to our customers in the USA! Non of us like shipping charges but hopefully this helps you guys out a bit. The offer is limited and runs until the 30th of June so don't hang around. Grab what you can and have make use of the half price delivery. Today is our official launch day – yes that’s right, the new online shop is now live and fully functioning! Head over http://britbikes.co.uk/ to see our extensive range of items for your vintage bike, from service items to everything you need for a restoration project. Your No.1 place for all things classic British motorcycle parts. © BritBikes 2015. Simple theme. Powered by Blogger.